World Parkinson’s Day takes place annually on 11 April to mark the birth of English surgeon apothecary, geologist,paleontologist, and political activist James Parkinson FGS who was born 11 April 1755 in Shoreditch, London, England. He was the son of John Parkinson, an apothecary and surgeon practising in Hoxton Square in London. In 1784 Parkinson was approved by the City of London Corporation as a surgeon. On 21 May 1783, he married Mary Dale, with whom he subsequently had eight children; two did not survive past childhood. Soon after he was married, Parkinson succeeded his father in his practice in 1 Hoxton Square. In addition to his medical practice, Parkinson had an avid interest in geology and palaeontology, as well as the politics of the day. He was also a strong advocate for the under-privileged, and an outspoken critic of the Pitt government. He was also involved in a variety of social and revolutionary causes, and some historians think it most likely that he was a strong proponent for the French Revolution. He published nearly twenty political pamphlets in the post-French Revolution period, while Britain was in political chaos. Writing under his own name and his pseudonym “Old Hubert”, he called for radical social reforms and universal suffrage. Between 1968 and 1972, Bob and Rita Marley, Peter Tosh and Bunny Wailer re-cut some old tracks in an attempt to commercialise The Wailers’ sound. In 1968, Bob and Rita visited songwriter Jimmy Norman at. A three-day jam session with Norman and others, including Norman’s co-writer Al Pyfrom, resulted in a 24-minute tape of Marley performing several of his and Norman-Pyfrom’s compositions. Including n “Stay With Me” and “Splish for My Splash”. In1972, Bob Marley embarked on a UK tour with American soul singer Johnny Nash. While in London the Wailers were introduced to Chris Blackwell this resulted in the offer to record an album. In Marley, Blackwell recognized the elements needed to snare the rock audience: “I was dealing with rock music, which was really rebel music. I felt that would really be the way to break Jamaican music. But you needed someone who could be that image. 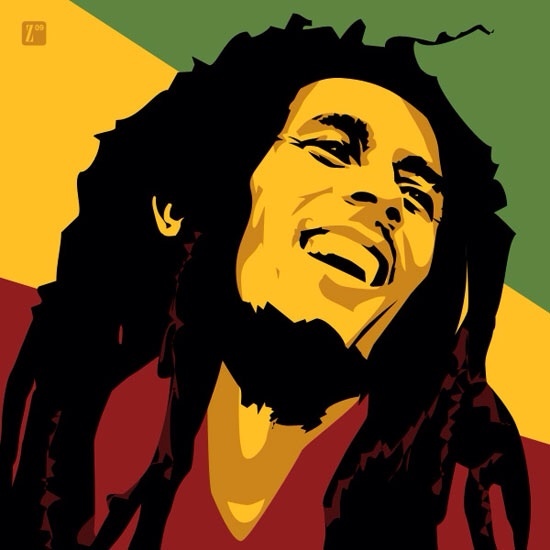 When Bob walked in he really was that image.” the Wailers returned to Jamaica to record at Harry J’s in Kingston which resulted in the album Catch a Fire in which.Blackwell desired to create “more of a drifting, hypnotic-type feel than a reggae rhythm”,and restructured Marley’s mixes and arrangements. Catch a Fire, was released worldwide in April 1973, packaged like a rock record with a uniqueZippo lighter lift-top. It was followed later that year by the album Burnin’ which included the song “I Shot the Sheriff”. Eric Clapton was given the album by his guitarist George Terry in the hope that he would enjoy it.Clapton was suitably impressed and chose to record a cover version of “I Shot the Sheriff” which became his first US hit since “Layla”The Wailers were scheduled to open seventeen shows in the US for Sly and the Family Stone. After four shows, the band was fired because they were more popular than the acts they were opening for. the Wailers broke up in 1974 with each of the three main members pursuing solo careers. The reason for the breakup is shrouded in conjecture; some believe that there were disagreements amongst Bunny, Peter, and Bob concerning performances, while others claim that Bunny and Peter simply preferred solo work. Welsh singer, songwriter, author, and broadcaster Cerys Elizabeth Matthews, MBE was born 11 April 1969 in Cardiff. The family moved to Swansea when she was seven. She attended St Michael’s, an independent school in Llanelli, and Fishguard comprehensive school when she lived in the Pembrokeshire village of Trefin. She is fluent in English, Welsh, Spanish, and French. She has cited her childhood heroes as being Pippi Longstocking and writers William Butler Yeats and Dylan Thomas. She learned to play the guitar at the age of nine, sang Welsh folk songs and taught herself traditional songs from all over the globe including blues and Irish folk songs. She was a member of the West Glamorgan Youth Orchestra. She had a stint in Spain as a nanny, where she learned to speak Catalan She was also a founding member of Welsh rock band Catatonia and a leading figure in the “Cool Cymru” movement of the late 1990s. Catatonia was formed in 1992. She subsequently sang lead vocals on, and co-wrote the music and lyrics for, the band’s hits. Songs she co-wrote included “You’ve Got a Lot to Answer For”, “Mulder and Scully”, “Dead From the Waist Down”, and “Road Rage”. Matthews also played guitar on the earlier material before second guitarist Owen Powell joined the band. She also performed a single with the band Space named “The Ballad of Tom Jones”, which tells the story of two lovers who want to kill each other, but then hear a Tom Jones song that defuses their homicidal feelings. Matthews later collaborated with Jones to record a version of Frank Loesser’s “Baby, It’s Cold Outside” on Jones’ album Reload. Matthews was voted the “Sexiest Female in Rock” in a 1999 readers’ poll in the now defunct magazine Melody Maker. After Catatonia’s rise to fame with their second album International Velvet, and subsequent success with Equally Cursed And Blessed, the band returned in 2001 with their fourth studio album Paper Scissors Stone. In September 2001, the band officially split. Matthews joined The Pet Shop Boys on the Pyramid Stage at Glastonbury in June 2000, performing a duet of their hit “What Have I Done To Deserve This”. In December 2001, she returned to the recording studio for the first time since Catatonia split up. She recorded a song in both English and Welsh for the pre-school cartoon series Sali Mali. She provided guest vocals on the track “Cyclops Rock”, from US alternative rock band They Might Be Giants 2001 album Mink Car. Her line was originally supposed to be provided by Joe Strummer of The Clash. In 2001 Matthews moved to Nashville, Tennessee and began performing with Bucky Baxter, who had played lap steel guitar for Bob Dylan and Ryan Adams. She had already collected seventy-six traditional folk songs with the idea of making an album of folk covers. She released Her debut album, Cockahoop, in 2003 and Whilst recording this album she met Seth Riddle, whom she married in Pembrokeshire. In December 2005, Matthews recorded a new version of Len Barry’s 1960s UK and US top 10 hit “1-2-3” in Nashville and released her second solo album, Never Said Goodbye. Containing the song “Open Roads” and featuring Kevin Teel on guitar, Ben Elkins playing keyboards, Mason Neely on drums, and Jeff Irwin playing bass. She also headlined Cardiff’s Big Weekend festival. In 2006, Matthews embarked on a UK and Ireland tour, playing acks from her first two solo albums as well as three Catatonia hits. She also embarked upon a short acoustic Welsh tour in November 2006 before returning to Nashville for Christmas. Matthews appeared on the 2007 series of ITV’s I’m a Celebrity…Get Me Out of Here!, Matthews also appeared at the live Guilty Pleasures concert at the Hackney Empire, London in 2007. She performed the Bonnie Tyler hit “Total Eclipse of the Heart” and the Dolly Parton/Kenny Rogers duet “Islands in the Stream” along with Terry Hall and the BBC Concert Orchestra. In 2007 She released the Welsh mini-album Awyren = Aeroplane which won her the ‘Contemporary Composition’ award in the National Eisteddfod. She also became Vice-President of the Welsh homelessness charity Shelter Cymru and became Performing Arts Ambassador for Linden Lodge School, Wimbledon. In 2008 Matthews joined the Welsh band Manic Street Preachers onstage at The O2 on 28 February 2008 to sing the female vocals of their 2007 hit “Your Love Alone Is Not Enough”. Replacing Nina Persson in both the awards ceremony (within indigO2) and at the following ‘Big Gig’ live show. Matthews also appears on radio programmes and hosts a weekly music show on BBC Radio 6 Music and a show on BBC World Service, From November 2008, Matthews sat in for Stephen Merchant and Marc Riley on BBC 6 Music and went on to present George Lamb’s slot in April 2009. In May 2009 she presented show A Month of Sundays With… Cerys Matthews. She then covered for Nemone on 6 Music from July 2009 while Nemone was on maternity leave. In April 2010, Matthews presented a weekend show on Sunday mornings And also produces and presents radio documentaries and shows, including Hook Line and singer, where she shared her love of fishing on Radio 4. In 2009 Matthews released The album, Don’t Look Down,in two versions, one in English and the other in Welsh (the title of the Welsh edition was Paid Edrych i Lawr). Matthews also covered Glastonbury Festival for both BBC Television and BBC 6 Music, she wrote and presented a BBC Two programme on poetry, and presented TV documentaries on singer Dorothy Squires, the Mississippi River and Cuba. She wrote and presented a documentary on early blues players such as Memphis Minnie, also Pippi Longstocking, Mahalia Jackson, iconic British blues label ‘Blue Horizon’. She has presented a documentary for BBC Radio 2 on Maida Vale studios and frequently contributes to BBC Radio 4 programmes such as Feedback, Frontrow, Loose Ends, Saturday Live, and writes a column for world music magazine Songlines. She has curated festivals for the Tate Modern, the Shetland theatre and Womex. In 2010, Matthews released her third solo album Tir (in Welsh: ‘territory’ or ‘land’), a collection of traditional Welsh songs, and of photographs from her family archive from the 1880s to 1940s of people at work and play. Including the songs “Calon Lân”, “Cwm Rhondda”, “Migldi-Magldi” (with Bryn Terfel), “Myfanwy” and “Sosban Fach”. In 2011 Matthews’ released her fourth solo album Explorer 2011), featuring the song Sweet Magnolia. This album Featured music she has heard round the globe, and the places she had visited including Spanish, Scottish, Irish, Welsh, and American styles, and genres. In 2012 Matthews played the Isle of Wight and the Hay festival with a Woody Guthrie tribute show, and collaborated with artists such as Arun Ghosh, Tunde Jegede, Attab Haddad, Frank Moon and the London Bulgarian Choir. she also performed music from her acclaimed and popular selling collection of Welsh traditional songs ‘Tir’, with Ballet Cymru, And was nominated for a Theatre Critics Award 2012 and released the Christmas album Baby, it’s Cold Outside. Cerys also played many UK literary festivals including Dartington, Chester, Hay and Edinburgh and released an album of traditional Welsh reels and songs Hullabaloo’. Matthews sang Patsy Cline’s Crazy and Dylan’s Blowin’ in the wind as part of the memorial service for esteemed War correspondent Marie Colvin. Matthews also appeared as a celebrity guest mentor on the first series of the UK version of The Voice for Tom Jones’s Team broadcast. In 2013 Matthews won gold at the Sony Radio Academy Awards, in the ‘Music Broadcaster of the year’ category. Baby it’s Cold Outside, released for Christmas 2013 on the Rainbow City label, is a selection of Christmas carols and classic Christmas songs all arranged and produced by Matthews using instruments such as Chinese temple blocks, oud, celeste and coconut shells. She was Artistic Director for the opening ceremony of Womex 2013 representing Wales. In 2014 Cerys co-founded a brand new interactive festival – THE GOOD LIFE EXPERIENCE with Charlie and Caroline Gladstone held every September on the Gladstone estate in Hawarden, Flintshire which celebrates the great outdoors-with plenty of abseiling, campfires, axe throwing, foraging, talk on survival, as well as cultural activities, crafts, books and music. In 2014 Matthews won a prestigious ‘St David Award’ – for her contribution to culture – run by the Welsh government, in its inaugural year- 2014 Other prize winners on the night were Bryn Terfel and Lyn Evans. She was also appointed Member of the Order of the British Empire (MBE) in the 2014 Birthday Honours for services to music. In July 2014 Cerys was awarded an honorary degree from Swansea University and won the Best Presenter Music award at the Audio Production Awards November 23, 2016. Matthews also makes documentaries for television and radio and is a roving reporter for The One Show and also wrote the book Hook, Line and Singer, Cerys’ collection of singalong classics which includes personal anecdotes and song histories. Song examples are “Let’s Go Fly A Kite”, “Oh Susannah”, and “Swing Low Sweet Chariot”. She also wrote Tales from the deep is a duo of stories written in verse with paintings by Fran Evans, which was nominated for a People’s Choice Award and was followed by Gelert, a man’s best friend. She also writes a column for British Airways Highlife magazine.